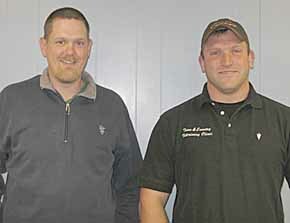 Dr. Cody Gulbrandson has become a partner with Dr. Jeremy Young in the Town and Country Veterinary Clinic. He recently purchased Chris Martinsen’s share of the practice. “Opportunities arose, and I decided to sell my share of the practice,” noted Dr. Martinsen. Dr. Martinsen will no longer be practicing at Town and Country Vet Clinic. Dr. Young, of Elgin, joined the practice in 2006 and purchased Dr. Rick Cockerill’s share of the practice in 2009. Dr. Gulbrandson, of Fullerton, joined the practice in January, 2011. Dr. Cockerill is also practicing part-time at the clinic, which is located in Albion with satellite clinics at Elgin and St. Edward. Details in the Jan. 25 Albion News Print and Electronic Editions.